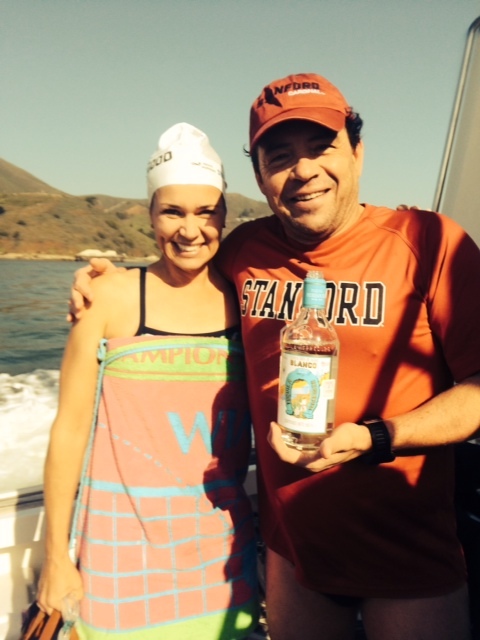 This morning I had the pleasure of swimming from Tiburon to The Golden Gate Bridge with my SF friends from Night Train and my teammate on our upcoming Sea of Cortez Swim, Antonio Arguelles, who flew in from Mexico. 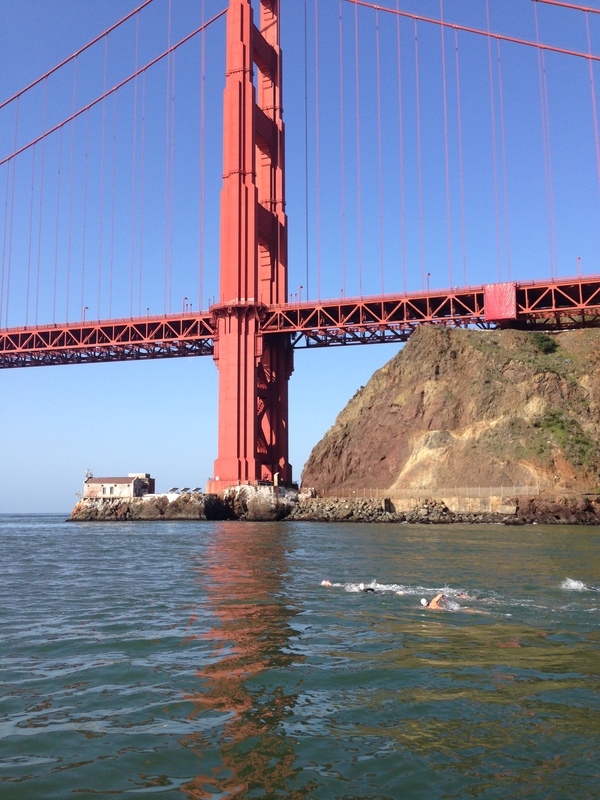 The water was about 13.5 degrees C and the current was in our favor– so much so that I had a moment where I was sure I was going to be swept out beneath the bridge far into the Pacific. I have a deep respect for the ocean and maybe it’s not good to have an imagination during these moments. One of the purposes of today’s swim was to get used to relay swimming– something I’ve never done before. 1. Personal belongings: bring very few of them. No big parkas or huge furry shoes. The Sea of Cortez is warm. Just cap, goggles, your anti-jellyfish sting cream, a credit card to slip in the back of your bathing suit to scrape jellyfish off your body in the water (because if you rub it, the venom poisons your body more), ear plugs to get sleep on a noisy boat, blinky things to put on your head while you’re swimming at night (apparently not the blue ones– the red ones you can get on Amazon are the best), an anti-nauseous patch so you don’t get sea sick (you can’t get on Amazon- need a prescription) and something you love to comfort you during the process (like a Snickers bar). 2. Attitude: This was my favorite quote of the day: “There’s no drama- if there is, it can tear apart the team.” This basically means that we’ve gotta accept now that it is going to be very hard and we’re going to get stung by jellyfish without fail and be in weird moments in the middle of the sea in the middle of the night where we are sure we’re alone– AND you’ve just gotta stay positive and not freak out. There was a lot of emphasis put on being a good teammate- giving each other encouragement..etc. I think this is very important. 3. Routine: Once you get on the boat, carve out your area where you sleep and put your stuff- always. You don’t want to be searching for your goggles 5 minutes before you need to get in at 2 in the morning. But if you do jump in at 2 in the morning without your goggles…. 4. Just Swim: There will be moments where you think everything is wrong. You forgot your goggles when you dove in at 2 am, you’ve been stung in the face and it feels like a 3rd degree burn, you’re swimming next to the boat in 10 feet waves and you’re sure it’s going to hit you… just relax. And swim. Trust the skipper.